Do you want to know how much dividend a stock will pay out to you? This dividend discount model will be so useful. With this dividends discount model you will be able to discover exactly what impacts dividends and how you can calculate them. While the dividends discount model has calculations you can do yourself, it is a lot simpler and more efficient to do them through this excel template. Let us take a look at how the dividend discount model works in greater detail. Information that needs to be entered into the dividend discount model is fairly simple. Some of the questions are yes or no, while others include more specific details. For example, you need to enter the net income, book value of equity, current earnings per share, and the current dividends per share. The beta, risk free rate, and risk premium of the stock must also need to be entered into the dividends discount model. There is also other information, such as length of high growth period, ROE, retention, and growth rate of the stable growth period need to be entered. These are simple informational aspects that can be found out from any balance sheet of a company. The great thing about this dividend discount model is that it makes everything so easy. Enter any information about different companies and you will be able to get the results you need. This dividends discount model is great for anyone who is interested in stocks and who needs to make these calculations on a regular basis. Typing out data and using a calculator to compute the dividends is very difficult. That is why you should just use the dividend discount model and make your life a lot easier. 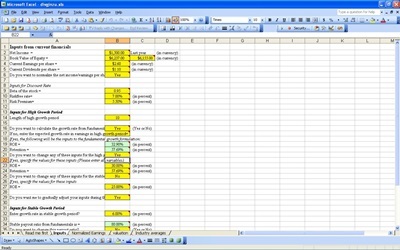 So get this Excel template and see how useful it is!